I would have liked to expound on the ports under the Davao PMO. But that would mean tackling all the ports in Davao Region and that is just too many. I also wanted to tackle the ports and wharves of Davao City but I will still be burgeoned with many ports and wharves that basically handle traffic only to Samal island. I thought the best was to focus on one distinguishing mark of the Davao ports and that characteristic is many of its ports handle foreign vessels. Among the combined ports in the country it is Davao which has the most since about 20 ports here handle foreign ships, some regularly and some occasionally. But this will not be limited to Davao City only but will include ports in Panabo, Tagum, Maco, all in Davao del Norte and Sta. Cruz in Davao del Sur. This is a stretch of ports of about 25-30 miles of almost straight linear distance. Another trait of Davao ports is a significant number of foreign ships that call in Davao dock in two or three different ports trying to fill up more cargo. Senator Bam Aquino filed a bill that became a law allowing that but he was two decades too late and his bill just showed his ignorance of maritime matters. Handling foreign ships is one thing that became more important in the last several years in Davao. 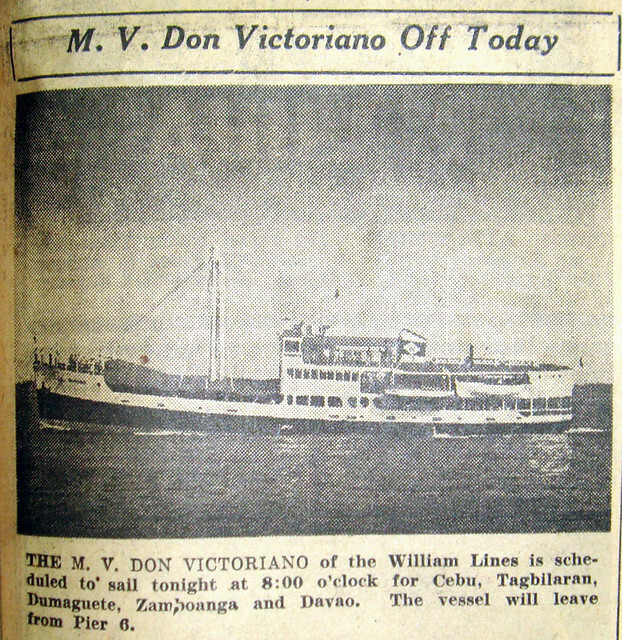 This became more pronounced especially when passenger liners from Manila stopped calling in Davao. To Sulpicio Lines that was force majeure since they were suspended by MARINA (Maritime Industry Authority) from sailing in the aftermath of the capsizing of the MV Princess of the Stars in 2008. For Aboitiz Transport System (ATS), they said “there was not enough cargo” (and after that their competitors were simply too glad to fill up the void created). The main type of foreign ship that calls on Davao are the regional container ships, otherwise called “feeder ships” abroad. I named it as such since they basically do regional routes especially in Southeast Asia and East Asia. Types like “Panamax”, “Handymax” or “Aframax”, etc. have no meaning in the Philippine context since only the smallest of international container ships call locally, in the main. Not that we are in an out-of-the way route but because that size is just what the size of our economy can muster (yes, we are mainly good only in producing people (and billiards players) and in fact, that is one of our main exports but they don’t ride container ships). Some of the ships that call in Davao goes all the way to Europe so not only regional container ships call in Davao. The second main type of foreign ships that call in Davao are the reefers or refrigerated container ships. These reefers and the regional container ships basically carry the export fruits (Cavendish bananas, broad-shouldered pineapples, solo papayas mainly but that can also include avocado, giant guavas and buko and many others) and export fresh produce (like lettuce, cauliflower and many other high-priced vegetables) grown in Southern Mindanao. Some of the refrigerated container vans loaded here come from as far as Agusan del Norte, Misamis Oriental, Bukidnon, Maguindanao and Lanao del Sur. Actually, almost all kinds of fruits and produce grown in farms and orchards are already exported now like camote, cassava, saging na saba (cardava in Bisaya), other varieties of bananas, mature coconuts, langka and gabi that we sometimes joke here that it seems they also cook ginataan (benignit in Bisaya) abroad now. Or make camote cue, banana cue, turon and ginanggang (https://en.wikipedia.org/wiki/Ginanggang) abroad. The third main type of ship that calls on Davao ports are the tankers (included here are the like-type LPG carriers). Some of these are chemical tankers and they load coconut oil in the many oil mills of Davao. Many of these are oil tankers that bring in fuel to the tanker jetties in Davao (and that is why fuel is cheaper here since many of our fuel is from Singapore). The fourth main type of foreign ships that call in the Davao are the general cargo ships or simply freighters. Some of these bring rice, some are Vietnam ships that load copra meal, some load desiccated coconut. The fifth main type are the bulkers or bulk carriers. However, this type is not that frequent in Davao. On the average, a total of more than 25 foreign ships call on Davao ports every week for an average of three four ships a day. In container volume, it is actually Davao which is number two in container ship calls ahead of Cebu and Batangas ports but behind Manila port, the national port. What happened is that after our first two main export commodity crops abaca and copra/coconut oil lost in the world markets because of economic shifts (abaca was displaced by nylon and copra/coconut oil lost to other edible oils) it is now fresh fruits and fresh produce (and also canned pineapple) which have taken their place. These are basically loaded in Davao as Southern Mindanao and Bukidnon practically lords it over the other Philippine regions in the production of those export goods as the other regions are still stuck to their traditional crops which are mainly not for export in significant quantity except maybe for the sugar of Negros. Sasa Port is the main port of Davao. It is a government-owned port and it is the biggest in Davao. It is also the base port of Davao PMO (Port Management Office which is equivalent to a regional division). Sasa Port has a total wharf length of about a kilometer and six or more ships of 80 to 180 meters size range can dock simultaneously and more if the ships are smaller and/or local. Foreign ships, which are conscious of demurrhage are the priority here and there are inducements like crisp foreign bills so they will be given priority in docking. Since Sasa Port has the tendency to exceed its capacity then ships that cannot be accommodated or are displaced are made to anchor off Sta. Ana Port so as not to congest the narrow Pakiputan Strait separating Samal island from Davao. One weakness of Sasa Port is the lack of gantry cranes. With that she cannot handle the gearless container ships that are now beginning to appear in Panabo Port. However, Sasa Port has the usual needs of foreign ships: reefer facilities, container yard, marshalling area aside from the usual open storage area. There are also transit sheds and a passenger terminal that is no longer being used. When regional container ships arrive speed is the essence in unloading so aside from their booms the reach stackers are widely used. There are two arrastre firms operating in the port. Sasa Port is due for expansion and renovation but its cost is shrouded in controversy and many local stakeholders and the local government unit of Davao City have formally objected. The administration of President Aquino then seems to be intent in ramming it through but now that plan is dead duck under the current Duterte administration. For sure, the plans will be modified as it was really overpriced. The two Panabo ports are next in importance to Sasa Port. To an outsider Panabo Port might look to be a single port but they are actually two, the TADECO (Tagum Agricultural Development Company) wharf of the Floirendos and the PACINTER (Pacific International Terminal Services) wharf of Dole-STANFILCO. Together, the two along with minority interests reclaimed part of the sea and built an extension port and yard. This is equipped with gantry cranes and it is called the Davao International Container Terminal (DICT). It is the only port in Southern Mindanao that can handle gearless container ships at the moment and this port is the main handler of the produce of “Banana Country”, the wide flat swath of land in the localities of Panabo, Carmen, Braulio Dujali and Sto. Tomas plus parts of other towns that is dedicated to the propagation of Cavendish bananas. In “Banana Country” there is nothing else to see for kilometers on end but Cavendish bananas. These ports of Panabo are private ports. The DICT expansion cost only P2.7 billion (and was financed by private banks) and that was the comparison used why the local stakeholders blanch at the quoted price of the proposed expansion and modernization of Sasa Port (well, just adding gantry cranes, cold storage facilities and a little extension will already make it modern). [Of course, there are other and sometimes unspoken issues and projects that are related to this but that should be in another article.] Besides, the Panabo ports are also “Exhibit A” against those who badger the government to build ports for them for free or to pandering politicians who promise to build international ports and terminals just to get votes. If there is really traffic then the private sector will build its own ports rather than wait for government to build the ports for them (after all they will earn, won’t they?). And if the private sector builds the ports it always comes out cheaper than if government had it built (it is a question of corruption, inefficiency and waste). However, though expanded, DICT still lacks docking space many times and so container ships and reefers have to wait. There is a modern, purpose-built port in Davao that was purposely-built for handling fresh fruits and fresh produce for export. This is the AJMR Port in the northern part of Davao City on the road to Panabo and this port is synonymous with Sumifru or Sumitomo Fruits, the biggest fruit distributor in Japan. Japan is known for having the highest quality requirement in fruits and they pay adequately for that. To meet that requirement, AJMR Port has its own vapor heat treatment (VHT) facility right inside the port, a plastic plant too and a factory for its carton boxes. However, the docking facilities of AJMR Port is rather limited and only two container ships or reefers can dock at the same time in its jetty-like wharf. By the way, AJMR is also classified as an “agro-industrial economic zone” which is similar to a “special economic zone”. That means it is enjoying a lot of perks from the government. In importance, the adjacent Craft Haven International Wharf and TEFASCO Port might be next in importance. Craft Haven is also a purpose-built port to handle fresh fruits for export. Formerly, the place was once a shuttered plywood factory. Many of its exports goes west to the Middle East and India which are new markets for Cavendish banana (introduced by “Operation Desert Storm”). Many of its cartons bear the trademarks of Arab brands as well as the famous Unifrutti brands (i.e. “Chiquita”). The operator and agent of Craft Haven have good connections with Muslim planters of Cavendish banana of SOCCSKSARGEN region. The port has cold rooms but compared to AJMR it does not have its own carton box or plastic factories. But wood for making boxes is delivered in the port. The Craft Haven International Wharf can handle up to three ships simultaneouslyvand the “Cala” ships are regulars there. These are ships that trade to Japan and Korea. I will go next to TEFASCO Port as it is just adjacent. TEFASCO means Terminal Facilities and Services Corporation. They so-famously won a landmark case then against PPA (Philippine Ports Authority) which set the principle that PPA can’t collect fees on ships docking in private ports. TEFASCO mainly docks local ships especially the container ships of Solid Shipping Lines but a few years ago they were able to lure Pacific International Lines (PIL) of Singapore which uses their wharf now to load container vans (these are the container ships with the name “Kota”). They only dock and does not engage in any processing of the fresh fruits and produce as they are not a “clean” port (a no-no in fresh fruits and fresh produce as it leads to contamination). Fertilizers and other contaminants are present in their port but refrigerated vans are practically hermetically-sealed unless Customs comes knocking. Holcim Port is just adjacent TEFASCO Port and it also handled foreign ships in the last few years when Sasa Port and Panabo Port were experiencing congestion. However, the primary ships that Holcom Port handles are ships that carry cement (naturally!) and these are mainly local ships. Holcim is actually a cement plant (actually the biggest in the Philippines) as many knows. With cement dust (and also coal) it is not also a “clean” port and so there are no processing facilities there for fresh fruits and fresh produce. It is simply a come and go operation there. In terms of future growth the Hijo Port in Madaum, Tagum City, capital of Davao del Norte might be next in weight. This port is now a joint venture between ICTSI (International Container Terminals Services Inc.) which is not just an arrastre service anymore but operator of ports in other countries and the Manila International Container Terminal (MICT) and Hijo Plantation with the former in the saddle. ICTSI is developing this port to rival Davao International Container Terminal although in volume they are not yet there. Hijo Plantation is the main user of the port although it is intended to intercept the container vans coming from the north and east of Tagum but the intent has not materialized yet. I will no longer go one by one with the other ports handling foreign ships as they are relatively minor or can just be bunched together. Universal Robina Corporation (URC) wharf sometimes handle bulk carriers which bring in imported wheat for URC’s need. The frequency of this in every few months or so. Down south in Astorga, Sta. Cruz, Davao del Sur, foreign ships load the products of Franklin Baker Company which is best known for its desiccated coconut which are mainly for export. Meanwhile, Davao City is host to several coconut oil mills like Legaspi Oil, INTERCO, DBCOM and the New Davao Oil Mill. Foreign chemical tankers come to load their products and combined the arrivals are at least a week in frequency or even more frequent, on the average. Additionally, Vietnam freighters come to load their by-product copra meal (an ingredient and protein source for animal feed). Davao is also home to several petroleum products depots like Chevron, Petron, Phoenix Petroleum and Shell. Aside from local tankers, foreign tankers also come especially those that come from Singapore. In addition, there are also LPG carriers that also come to the Price Gases jetty in Sta. Cruz, Davao del Sur, the Isla LPG Corporation wharf in Davao City aside from the tanker jetties of the petroleum majors and many of these are foreign vessels. The frequency of these foreign tankers and LPG carriers combined might be every week also. Once in a while, a foreign ship will also come to Maco Port in Davao del Norte. This port is just near the Hijo Port in Tagum and both are located in the innermost portion of Davao Gulf (which is actually a bay). And that sums up all the ports of Davao PMO handling foreign vessels. Sasa Port and DICT dominates the handling of the foreign ships. DICT don’t even handle local ships, in fact. The other ports, except the tanker jetties, started handling foreign ships because of the congestion of Sasa Port and the Panabo ports (except Hijo Port which handled their own shipments from the start). With many ports handling ships, both foreign and local, one unintended benefit was road traffic did not build up so fast in the port areas of Davao unlike in Manila which is dependent on so few ports. Maybe a lesson can be learned here.